Our phones already do plenty of things well beyond making calls and sending messages. Seriously, it’s evolved into a much more versatile tool than anyone probably imagined. And it’s not finished yet. 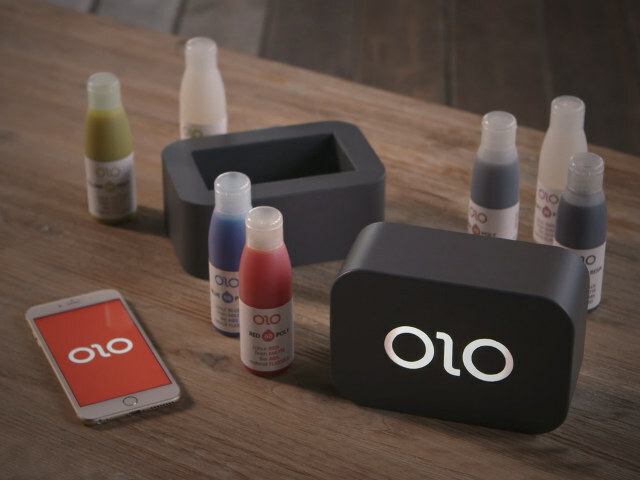 This time around, a product called OLO vows to turn any phone into a functional 3D printer. While many 3D printers can interface with phones via apps, this one actually uses your phone to cure the resin. That’s right, your phone actually becomes an essential cog in the fabrication process, with the printer using the light from the phone's display to shape any object you’re producing. Created by Solido3D, OLO is a portable 3D printer measuring 6.8 x 4.5 x 5.8 inches (w x d x h), making for, arguably, the first digital fabrication tool you can throw in a bag and carry everywhere (it's way smaller than the already compact M3D Micro). To use, you simply launch the app on your phone, choose the model you’re fabricating, and lay your phone down on a flat surface. From there, you place OLO’s lower component on top of the phone, pour the recommended amount of liquid resin, and place the top component (which holds the build plate and control electronics) to cover everything. Printing will commence on its own, with the app making your phone’s screen light up with a specific pattern that corresponds with the model. A polarized glass on the bottom of the lower component takes this light and shines it outwardly, redirecting it to cause a layer of resin to harden. The build plate slowly rises as each layer of resin hardens until the whole model is finished. There are no details on how long printing takes, but we’re assuming it’s going to be time-consuming similar to traditional 3D printers. A Kickstarter campaign is currently running for OLO. Pledges to reserve a unit starts at $99.